Satoshi Takashima leading a training session with young players at Westwood High School. Although the association is in its fledgling stage, the plan is for long term development of the sport in the parish. The Trelawny Table Tennis Association (TTA), which came into being in January with its main purpose, the development of the sport through board base recruitment and to work on its training of players, coaches, referees and other game functionaries. Raymond Lawrence, President of the Association, told the Western Mirror that the organization is here to ensure that table tennis in Trelawny, which has produced such greats as Anita Belnavis and Aldith Ellis, can match against other popular sports in the parish. 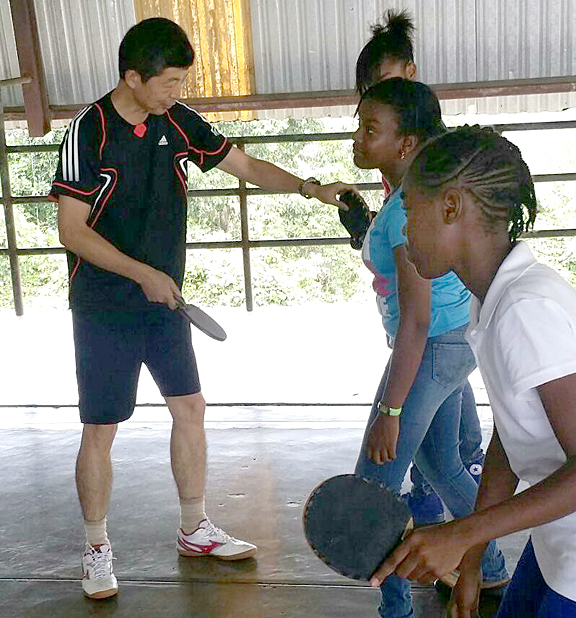 He disclosed that recently they had the honour of National Team Coach, Japanese native, Satoshi Takashima, who is on secondment to the National Association carry out coach-led training sessions in the parish with several students from Westwood High School participating. He related that at the conclusion of the training, coach Takashima revealed there were some positives identified and he would be seeking to do follow-up with some of the standouts. Also recently, in a bid to promote the sport at the grassroots and youth level, there was a handover exercise of a table tennis board and equipment to the Hague Primary School in the parish. It is expected that students, in utilizing the equipment under guidance can develop in future players and champions in the sport. He further highlighted that the Association is now putting in plans to boost the sport locally with the introduction of a business house league that is set to kick-off in June.